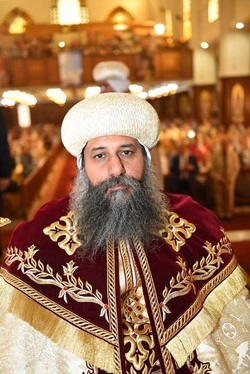 In his speech on the eve of the ordination of the new bishops, His Holiness Pope Tawadros presented the biography of the Monk Moses Ava Moussa, the candidate for the Diocese of the North and South Carolina Parish, a new diocese in the United States. ​His Holiness said: Monk Moses Ava Moussa is from St. Mary and St. Moses Abbey in Texas. He is the first candidate from this Abbey. It is a great blessing that he is a Dispora nominee. This is in accordance with the vision developed by the departed His Holiness Pope Shenouda. He was born in 1974 and has a bachelor's degree from New Jersey. He worked at several companies. In 2005, he joined the Abbey of the Virgin and Anba Moussa in Texas under the patronage of His Grace Bishop Yusuf and was then appointed to the priesthood. He was awarded the rank of Qmos in February 2016. He worked at the Abbey as Administrative Director. He then worked for seven years as an Associate Director of the Abbey and was responsible for the Abbey's library. He was the first monk to join this Abbey. He served at the Church of Pope Cyril VI in Tennessee. His father, Deacon Yohanna Ibrahim is dedicated to the Church of St. George and St. Shenouda in Jersey City, New Jersey and was serving at the Churchs of St. Mary in Materia and St. Mary in El Zeiton before traveling abroad. Bishop Peter was nominated by some of the Fathers of the Church to be the bishop of this fourth Coptic Diocese. Bishop Peter enthronement's celebration day at Saint Mary Coptic Church in Raleigh, NC. Bishop Peter's first liturgy at Saint Mary Coptic Church in Raleigh, NC.